While the winter storms had more people being colder, longer than ever before, it also dropped record amounts of snow across the country’s mid-section and up toward New England. All that snow sits trapped by the cold – like so much water behind invisible dams that will release their impoundments as temperatures rise. So, without so much as a drop of rain, many places around the country will be looking at significant floods. 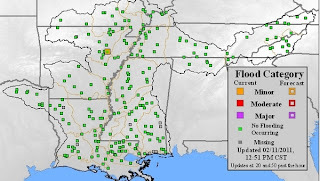 The snow-melt floods, the resulting fullness of the river systems, and the often super-saturated or still-frozen condition of the ground, will exacerbate rain-induced flooding. Rivers and streams will be more prone to flooding in rain storms that would not have otherwise produced floods. It is a particularly difficult year for flood forecasters in much of the country, because the rate of release (snow melt) is uncertain. NOAA’s National Weather Service (NWS) operates thirteen River Forecast Centers across the United States. 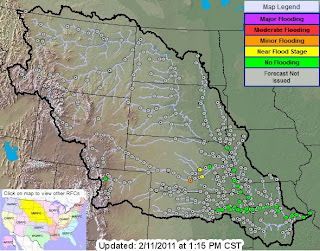 River Forecast Centers collect, process, and provide forecasts and information about water resources for major river basins across the country. 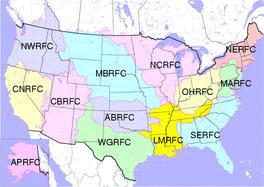 This network is supported by the extensive gauge system of the US Geological Survey (USGS) and gauges operated by the Corps of Engineers and others. The USGS WaterAlert widget on the EDEN Floods and Flooding page allows the user to get past and present readings, but forecasts are provided by the National Weather Service. Delegates should touch base with local emergency managers to see what is being predicted for their area. The situation up north – in the Missouri Basin RFC – is mostly unpredictable (based on the number of grey gauges (forecast not issued)). 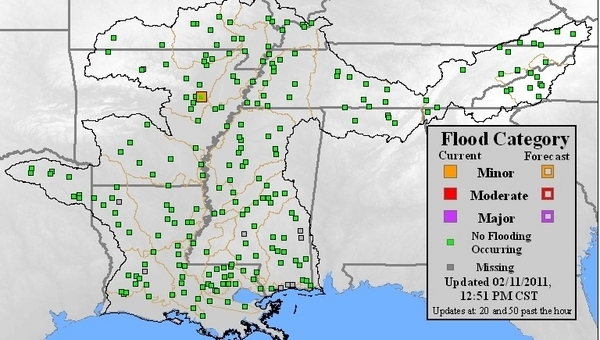 Down south, in the Lower Mississippi RFC area, we’ve got one gauge where minor flooding is predicted in the near term. But lots of snow fell above us. We have asked the Association of state Floodplain Managers to help us get a national perspective and outlook. What are the hot-spots for snow-melt flooding? Where is the Corps preparing for flood flight operations? EDEN will be conducting a series of flood help Webinars to help our educators know where flooding is anticipated; and how we can help our citizens deal with the threat, stay safe, and protect their properties and pocketbooks from flood damage. Webinars are being announced by e-mail and through the EDEN News and Features. The first Webinar is scheduled for February 21. Previous PostPrevious Extension: How’s Your Continuity Plan?